The seniors on the tournament bound girls soccer team were honored before their game last week with Cohasset. These photos were taken by RHS trainer and yearbook photographer, Kelley Reale. Caitlyn Sugrue and her mom and dad, Patty and Paul. Kayla Frazer and her parents Julie and Charlie Frazer. Leah Benson and her parents, Michael and Laurie. Molly Garrity along with mom and dad, Kathy and Joe. Stephanie Collyer and her mom, Liz. Taylor Lambrinos and her mom and dad, Erin and Scott. Erin Mulready and her parents, Janet and Tom. Victoria Pratt with her parents, Keven and Lisa Pratt. Kelsey Daggett with her mom Kathleen and her grandad, Pup. The girls have one more regular season game. Check our website for info on the girls tournament schedule next week. The boys soccer team is ready for tournament and took time out before their last regular season home game to honor the seniors. Photos were taken by RHS trainer and yearbook photographer, Kelley Reale. Goalie Matt Nicholson with his parents. Shawnn Kane with his mom and dad. Jonathan Turner with his parents. Tim Daggett with his mom, Kathy and grandfather, “Pup”. Gerard Saucier with his mother. The Scheim brothers, Andrew and Kyle with their parents. At the Homecoming football game on Saturday afternoon, Molly Garrity was chosen as Miss Rockland 2013 by her teachers and fellow seniors. Other nominees for the title were Georgia Panagiotidis, Leah Bensen, Jackie Carlson, Julia Ferrante, and Sarah Fitzgerald. Photos by Sarah Margolis. The students of Rockland High chose their Homecoming Court on Saturday night. King Joe Rizzotto and Queen Haley Reardon were joined by freshmen Grace O’Malley, sophomore Kiera Tobin-Rossman, junior Brianna Starkey, and seniors Kelsey Daggett, Gabbi derKindern and Jackie Jordan. 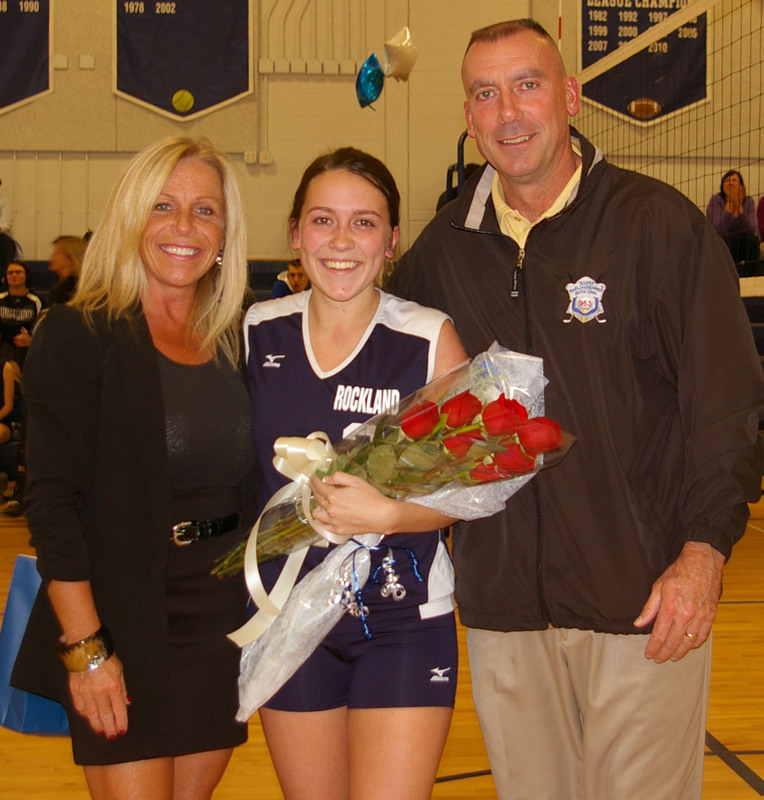 Senior Rachael Spinney with her parents Mike Spinney and Toni Marrese. The RHS volleyball team honored its four seniors on Monday, October 21st before their final home game of the 2013 season. The seniors include Ally Cerrato, Georgia Panagiotidis, Kelsey Joyce and Rachael Spinney. The girls were joined by their parents at half court and were presented with flowers and gift bags by their teammates. Head Coach Craig Johnson congratulated each senior volleyball player for her four years of dedication and commitment to the RHS volleyball program. 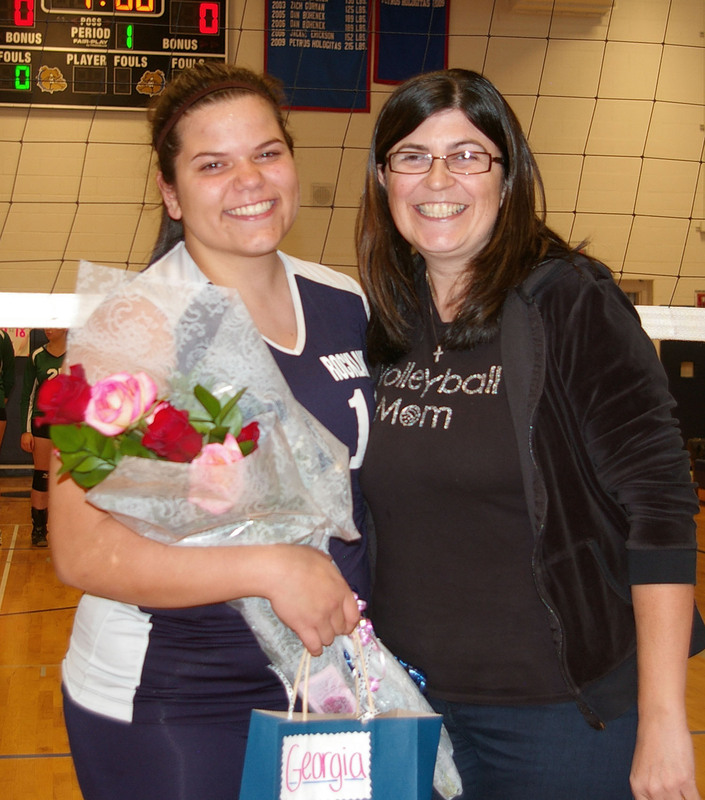 Senior Georgia Panagiotidis and her mother, Vasiliki Panagiotidis. 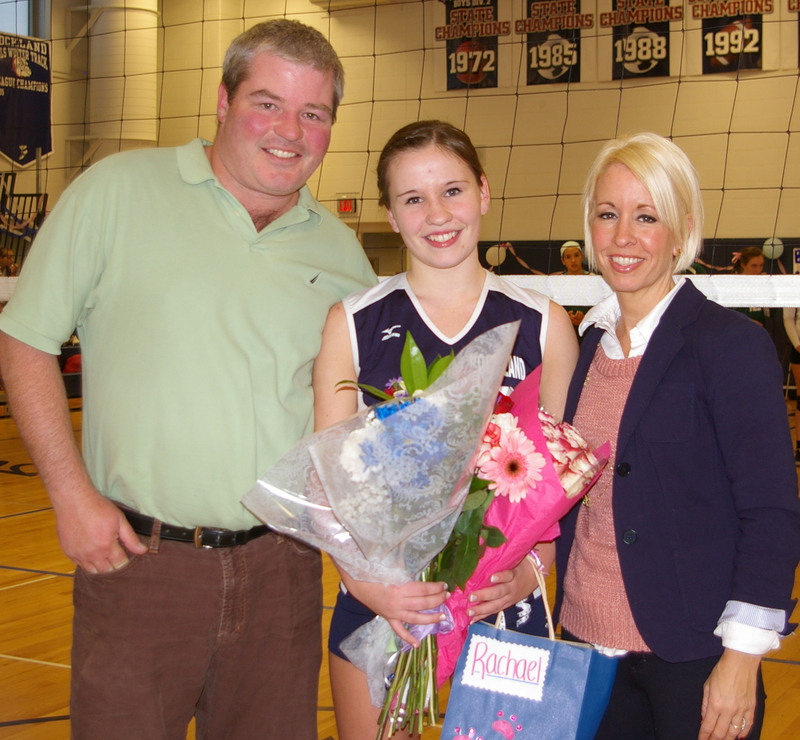 Senior Kelsey Joyce with her parents, Susan and Thomas Joyce. 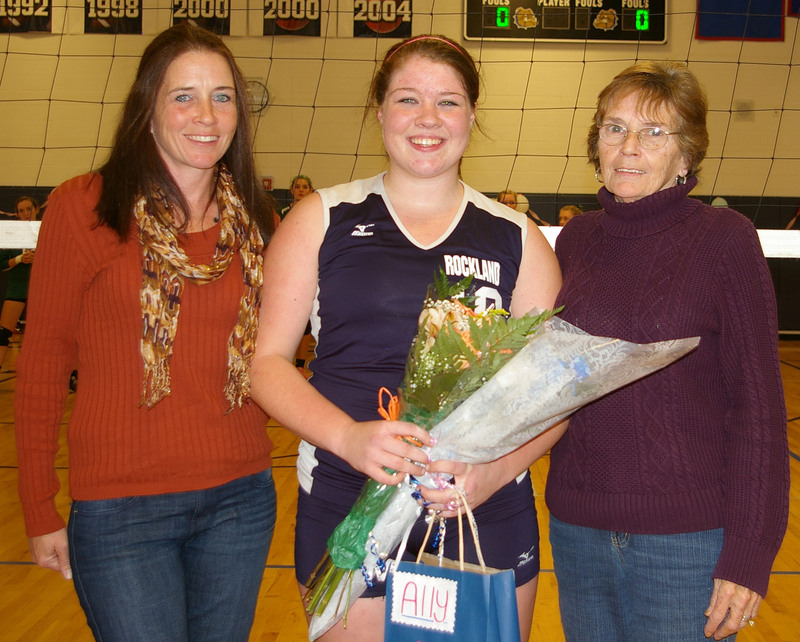 Senior Ally Cerrato with her mother and grandmother, Christine and Linda Erardi.